Clarksville, TN – Austin Peay State University’s (APSU) football team hits the road one more time before its bye week when it travels to Southeast Missouri to take on the Redhawks 1:00pm, Saturday, at Houck Field. The Governors (3-3, 1-2 OVC) are coming off their first Ohio Valley Conference victory of the season after defeating Tennessee State in front of a record crowd of 12,201 at Fortera Stadium. They will look to start an OVC winning streak when they play against the Redhawks (3-2, 1-1 OVC), who are coming off a dominating 70-38 victory against Tennessee Tech. The Govs found a groove in the running game against TSU, pounding out 258 yards and six touchdowns on the ground. They also made explosive plays in the passing game, averaging 27 yards per completion. They face a defense that has allowed more than 500 yards of offense per game. SEMO linebacker Zach Hall leads the OVC and ranks third in the nation in tackles per game (12.6). After forcing five turnovers against a potent TSU offense, the Govs will have their hands full with another powerful group. The Redhawks boast the 25th-ranked offense in the FCS, putting up 456.4 yards per game, and they feature the 12th-ranked scoring offense in the country, averaging 38.6 points per game. Running back Marquis Terry is second in the county in all-purpose yards, and has rushed for 650 yards and six touchdowns in five games. Quarterback Daniel Santacaterina has been named OVC Newcomer of the Week twice this season. He has completed nearly 63 percent of his passes for 1,091 yards and 11 touchdowns to five interceptions. “We play a great team on the road this week in SEMO,” head coach Will Healy said. “I know how physical they are; I know how prepared they’ll be. I got a chance to watch them a bunch on film. I think their back is an All-American candidate, their quarterback makes great decisions, they’ve got a couple wideouts that are really good weapons. After the second of his 17 total tackles against TSU, Gunnar Scholato became the 15th Governor to record 300 career tackles, and just the third since 1978. He is one of only two active players in the FCS with 300 career tackles, trailing only Dylan Weigel of East Tennessee State. Scholato is second in the OVC and 13th in the country averaging 10.0 tackles per game. The Govs recovered four TSU fumbles, the first time they had four fumble recoveries in a game since playing St. Joseph’s (Ind.) in 2003. That brings their season total to six fumble recoveries, which is the most in the OVC and 14th in the FCS. The defense has forced multiple turnovers in each of the past three games, and has turned the opponent over at least once in every game this season. The unit has recorded at least one takeaway in nine straight contests, dating back to 2017. The Govs rank 22nd nationally in turnovers gained (12) and 23rd in turnover margin (+4). With 258 rushing yards against TSU, the Govs are averaging 244.5 yards per game on the ground, which ranks 16th nationally. The Govs scored six touchdowns on the ground against the Tigers, bringing their season total to 17, which is tied for 8th in the country. In addition to paving the way for one of the nation’s most effective ground attacks, the offensive line has helped keep its quarterbacks upright all season. The line has allowed just six sacks through six games, which is tops in the OVC and 16th in the country. 12,201 – Saturday’s matchup against Tennessee State was a standing-room only sellout of 12,201 people that blew away the previous Fortera Stadium attendance record of 9,428, set last year during homecoming against SEMO. 15.5 – The Govs are averaging 15.5 yards per completion, which is first in the OVC and 13th nationally. Jeremiah Oatsvall hit Baniko Harley for 73 yards against TSU, the longest reception of Harley’s career. 224 – Kentel Williams posted 224 all-purpose yards against TSU (74 rushing, 11 receiving, 139 kick return). It is the fifth game of his career with more than 200 all-purpose yards, and the second this season (270 at MSU). 42.2 – Devin Stuart leads the OVC and ranks 30th nationally, averaging 42.2 yards per punt. He has six of 50-plus yards, including a season-long 65-yarder against Jacksonville State, just one yard shy of his career high. 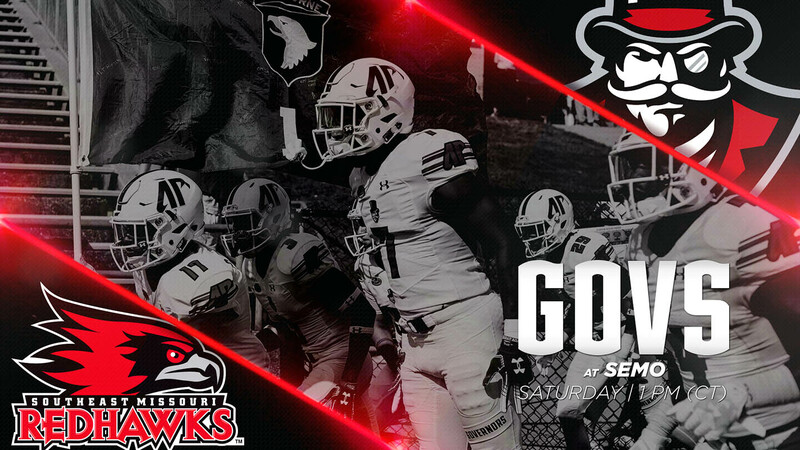 Be sure to follow all the Austin Peay football action at LetsGoPeay.com and the official Facebook page of Austin Peay Athletics. In addition, live play-by-play coverage can be found on Twitter (@AustinPeayFB) and PeayStats.com. Live coverage from this weekend will be provided via streaming (ESPN+).